This item has seen very little use. 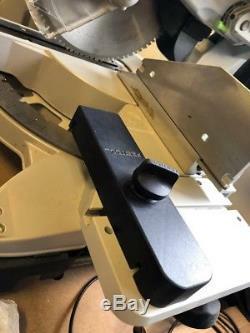 Was my back up saw. It comes with the following items. 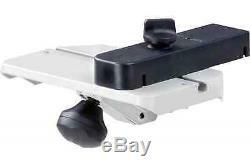 UG portable Base Frame - For easy carry of the saw. 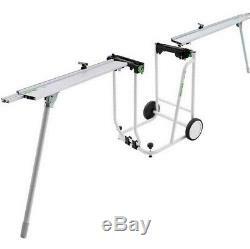 Right and left hand extensions with telescopic arms - (Festool carry bag is included). 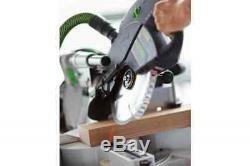 305 x 120mm cutting capacity. Folding UG base frame with transport wheels. KS 120 mitre saw supplied with the UG portable base frame along with right and left-hand extensions making this a complete workstation. KS 120 Mitre Saw The KS120 has additional features allowing it to do a lot more than other mitre saws. There is a special cutting position for cornice and skirting board up to 120mm deep and maximum cut of 168mm for cornice/crown moulding with the optional stop and angles are uniquely transferred with the bevel gauge included. Compound and mitre angles can be set quickly and accurately with easy to read scales on both hands, trenching cuts can be set with stepless adjustment. 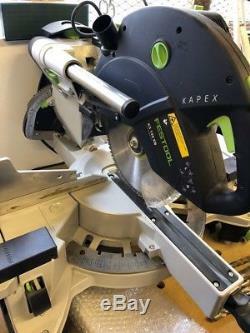 The saw runs on fixed double bars so that it traverses for improved precision and elimination of rear overhang, also fitted is a double laser line for true kerf of the saw blade. 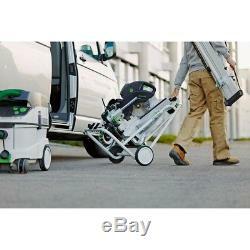 The 260mm blade with Festool Fastfix lock system prevents accidental powering up when blade changing, all this is combined with soft start, constant speed, overload protection and braked motor. 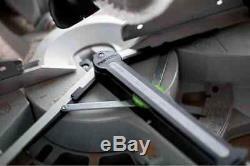 The saw is supplied with a 60 tooth saw blade, angle finder and work clamp. Base frame (UG - KAPEX) with detachable right and left had extensions The KS120 fits easily onto the base frame giving a working height of 900mm, the base frame makes the saw very portable allowing the saw to fold down into it, two wheels are fitted and the frame acts also as a handle to make transport easy. 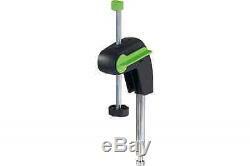 Detachable right and left-hand extension The left and right extensions fit the base frame and are each 1,480mm in length and have a telescopic extension giving each a maximum support length of 2,400mm, complete with measuring scales. 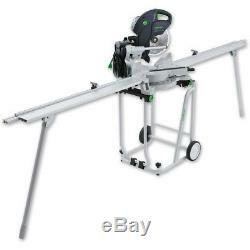 Set is supplied with a KS120 Saw, UG portable base frame, clamping set and 2 table extensions. 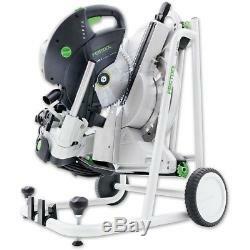 The item "Festool Sliding compound mitre saw KS 120 EB GB 240V KAPEX" is in sale since Saturday, June 16, 2018. 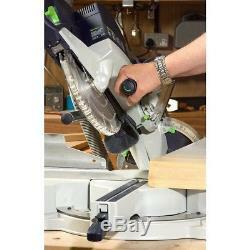 This item is in the category "Business, Office & Industrial\Power Tools\Saws\Saws\Mitre Saws". 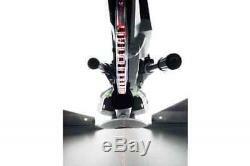 The seller is "johnnyf5ve" and is located in Newport.